With E3 right around the corner, leaks are bound to happen, but this one might be one of the biggest ever if it turns out to be true. 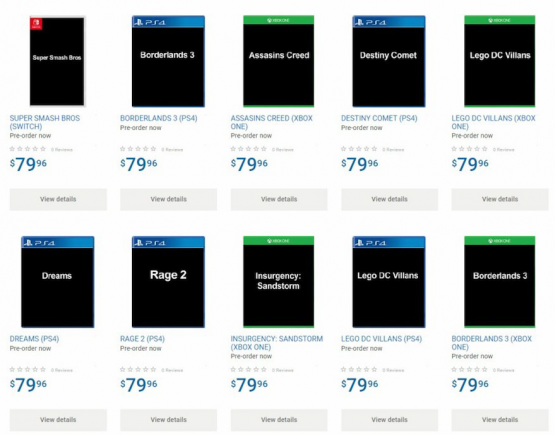 Earlier today, a batch of retail listings from Walmart Canada released seemingly prematurely and might have outed a ton of E3 of surprises, including a new Splinter Cell game, Rage 2, Borderlands 3, Gears of War 5, and many more. According to the now deleted listings (via Wario64 on Twitter), there were a lot of titles listed, including Tom Clancy’s The Division 2, Borderlands 3, Beyond Good and Evil 2, The Last of Us 2, Just Cause 4, and Final Fantasy 7 Remake. While most of the listings seem to be legitimate, there were some, namely “Forza Horizon 5,” (Forza Horizon 4 hasn’t even come out yet) that just seem incorrect. While no company will likely comment on this leak or the validity of it, it isn’t out of the question for titles to have been leaked so close to the event. People have patiently waited for new E3 2018 details, and Ubisoft has finally spoken. The company took to Twitter to confirm that their pre-show briefing will take place on June 11 at 1 p.m. PT / 4 p.m. ET. While Ubisoft remained vague on the details, we can reasonably speculate which titles will be covered at the annual gaming convention. Earlier this year, the studio had announced that Tom Clancy’s The Division 2 is set to appear at E3 2018. We only know that Massive Entertainment is in charge of development, which makes E3 2018 ideal for more concrete data and a possible release date. And who could forget Beyond Good & Evil 2? A rumored sequel had been simmering for well over a decade, so disclosing additional information is only logical after they had finally confirmed it during E3 2017. If these turn out to be true, which game are you most excited about? Let us know in the comments below.